Here at Create Excitement DJ Entertainment, we work hard to help our brides and grooms plan their perfect wedding! Our website highlights past weddings, resources, and wedding venues across the state of New Jersey and beyond. Be sure to check back here frequently, as we showcase new venues regularly. Who knows, you may find your dream venue right here! Here are some Wedding Reception Venues, NJ and beyond for you to check out, many offer 360° virtual tours. Want details on a specific venue? Let us know! Create Excitement DJ Entertainment is proud to be a recommended vendor of the Fiddler’s Elbow. Nestled in the picturesque countryside, Fiddler’s Elbow Country Club is one of the most distinctive estate settings on the East Coast—and a favorite of bridal couples. From the moment you arrive on their beautifully landscaped drive, the enchanting 40-room English manor clubhouse and scenic grounds create an inviting ambiance. Reserve an al fresco riverside backdrop for your wedding ceremony, and for your reception, a ballroom with floor-to-ceiling windows revealing finely groomed golf courses. This wedding facility presents a varied selection of banquet rooms and dining rooms, many accented by fabulous fireplaces, chandeliers and views, in addition to spectacular outdoor spaces. From start to finish, Fiddler’s experienced staff conducts events at the highest level and provides impeccable, one-on-one service. The Somerset Ballroom seats up to 300 guests and can be reserved for your exclusive, all-day use. The adjoining Patio is available for outdoor pre-receptions. Fiddler’s Elbow also offers smaller rooms, with their own charm and character, for your wedding reception venue. Weddings at Fiddler’s Elbow Country Club require an affordable House Membership. Celebrate your special day in tranquil Warren County, just fifty miles from NYC. The spectacular scenery of the golf course provides the perfect backdrop for an outdoor ceremony and cocktail hour. As the only bride on premise, there will be no doubt that every detail of your wedding is given the attention it deserves to create memories that will last a lifetime. Cosmopolitan, New Jersey’s premier banquet facility, is a venue that represents quality. Quality is an essential characteristic that we apply to our values and elements of hospitality, including knowledge, ambiance, taste and courtesy. Our mission is to provide our customers with exquisite cuisine, focused execution and outstanding service. These fundamental principles have contributed to the unique individualized experience we offer at Cosmopolitan in Wayne, NJ. Drawing on the Truesdale family’s 30 plus years experience, Clarks Landing in Point Pleasant was flawlessly designed and built with “state of the art” attention to detail while maintaining the classic elegance of your summer mansion at the shore. Hosting only one wedding at a time makes us “exclusively yours” so that our wedding professionals can attend to each and every detail of the day you have dreamed about and planned, for so long. Since our inception 50 years ago, The Grand Bethwood name has become synonymous with an unforgettable experience. We have built a reputation for uncommon quality and exemplary service. Trust your special day with Il Villagio for an experience like no other. With attention to detail and old world sophistication, Il Villaggio delivers a lifetime of memories at one of the best wedding North Jersey wedding venues. Personal attention to detail is paramount, making this the perfect place for your wedding reception. Our banquet facility is yours exclusively, for we only host one wedding at a time. At this magical time of infinite possibilities, we welcome you to Knoll Country Club, New Jersey’s most elegant and acclaimed catering facility. From our superb cuisine to our breathtaking ballrooms and scenic fairways, Knoll Country Club offers the perfect setting to create magnificent memories. The Loeb Boathouse is the only Manhattan venue right on a lake—allowing you to host your wedding in spectacular fashion..
Hand-painted ceilings with crystal chandeliers adorn the grand ballroom while tastefully displayed artwork and antiques add to the opulent ambiance and celebratory feeling of this unique venue. Each event has the luxury of two private cocktail rooms that open up to beautifully landscaped sitting areas, a bridal suite, and an outdoor garden for ceremonies..
Maritime Parc provides diverse options for different styles of weddings through utilizing their two event spaces, The Sky Room and The Aviary, and their accompanying wraparound outdoor areas. The view from all angles will offer a picturesque backdrop that will live on in memories – and photographs – for years to come. The ultimate private dining in Edgewater, NJ / Edgewater Commons is at Mitchell’s Fish Market. With our warm hospitality and attention to detail, we’ll work with you to create the event of your dreams. With a variety of rooms to fit any occasion and our talented team, your event is sure to start and end on a truly delicious note. From intimate family gatherings to large corporate events, we work with you to create a menu that works best for your occasion. Host anything from a holiday party with a themed buffet to match to a fundraising gala with eclectic passed hors d’oeuvres. Nestled midway between Manhattan and Philadelphia on 15 rolling acres, the Park Château Estate & Gardens is a beautiful wedding venue and event hall bringing guests over 30 years of catering experience straight to their table. This elegant wedding venue allows its visitors to step into the pages of a classic French Novel by embracing the gorgeous architecture of the time and capturing the essence of romance. Located in East Brunswick, New Jersey, the Park Château Estate & Gardens is an ideal midway point for many families and friends in the tristate area. A magnificent New Jersey Landmark reborn… Step back to an age of glamour and elegance. The gracious and elegant Park Savoy Estate presents more than 50 years of catering tradition, re-envisioned with a spectacular multi-million dollar renovation and restoration. The sweeping views of the gardens and landscape beyond creating the perfect setting for your Garden Wedding. The Penn Club of New York is The University of Pennsylvania’s dream of a “home away from home.” It is an exclusive private club for those affiliated with The University of Pennsylvania and our select affiliate schools and organizations. Located in midtown Manhattan, the historic landmark clubhouse boasts 13 floors filled with member activities, benefits, and clubhouse resources. Ramsey Golf and Country Club is a historic property nestled near the heart of Ramsey in Bergen County, NJ, just 30 miles from Manhattan. Our Club is surrounded by a formal English garden, scenic 18-hole golf course, lakefront pool and beach and paddle tennis facility. Ravello’s, a Tuscan villa set amidst an elegant and serene setting, could easily be in Florence or Rome – for it’s truly a world-class establishment in the image of Italy’s finest. The Royal Manor earned its reputation by providing personalized service and superb cuisine through extensive experience in the restaurant and catering industry. The facility sits across from the beautiful Dahnert’s Lake park, where all your pictures can be done on the bridge that connects to the island in the middle of the lake. Perry Bonadies, former General Manager of Lake Valhalla Club for over 26 years, and Michele Bonadies, professional wedding ceremony coordinator, are the owners of this new venture. 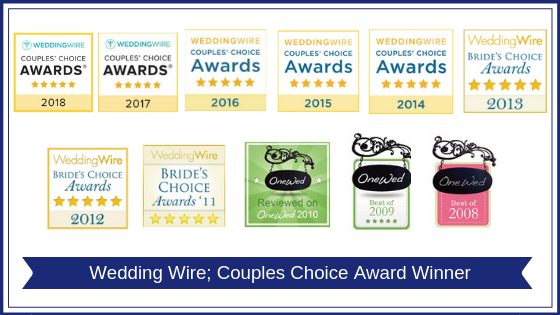 Perry and Michele bring their extensive experience and knowledge to running both Rock Island Lake Club and Bear Brook Valley, as they have managed over 3,000 weddings, ceremonies, affairs and social gatherings. From a 225-guest wedding ceremony to a 300-guest cocktail reception, the Ryland Inn envelopes you and your guests in our elegant estate setting surrounded by a rich history of equestrian tradition and farm fresh ingredients. Let us make our rich history and tradition a part of your greatest memory. Imagine floating along New York’s breathtaking harbor. Enjoy wonderful food, lively music and the peace of mind that your guests are thrilled to be part of a one-of-a-kind wedding event in Manhattan. Work side by side with our talented wedding planners to create an entertaining wedding event your family and friends will remember forever. From the seven acres of magnificent gardens with beautiful gazebos, to the first class, exquisite cuisine and professional white glove service, The Tides Estate has achieved nothing less than total satisfaction among its clients for over 30 years. The Tides Estate boasts spacious, tastefully decorated banquet rooms which can accommodate parties of any size. When it comes to creating memories that last a lifetime, the Valley Regency splendidly sets the stage for your magical, once in a lifetime event. Service above reproach, heavenly cuisine, and precise attention to detail ensure every moment is imbued with enchantment, romance and joy. At Waterside we offer our Premium Wedding Package. This is a carefully selected menu designed by our Executive Chef for your special day. Our five hour Premium Wedding Package begins with cocktail hour in our second floor, Hudson Room. During this hour guests are treated to a bountiful selection of hot and cold passed hors d’oeuvres passed butler style by our exceptional catering staff.